Description: As Artie stepped into the horrific scene of his peaceful village torn to pieces, he quickly hides when he hears a monstrous-sounding voice in the distance. Three werewolf-like figures entered the scene; one of them being Bern. Bern likes to think of himself as leader of the trio of Cern, Bern and Usn. Being the tallest and the strongest of the group, that can certainly be the case. But he is constantly met with disobeying and insults by his two companions. They never really listen to him, or care for his orders, which often gets him mad and short-tempered. Bern takes his position as a soldier very seriously. Especially after apparently knocked down from captain status to elite grunt because of his allies’ nuisance behaviours. He didn’t take the demotion all that well and wants to prove at every opportunity how rightful he is as a captain to his superiors. Because of this, he rarely participates in loitering and casual activities and basically never does anything fun. Nevertheless, he is good at what he does. And he nearly had the upper hand against Artie by using the classic “hiding in the shadows trick” native to every Skorned, but didn’t count on the unforeseen power of a boot to the face. Appearance: Bern is the tallest of the trio, as well as the most muscly. He is also the thinnest of the trio. His skin is in the middle between Cern’s and Usn’s; reddish and gray. The similarities that he shares in appearance with Cern and Usn is that they are of the same breed (golden jackal), and they’re Life Armour (which is what I’m calling them now) is on their entire jaw. Though his size is still not close to some of the biggest Skorned there are, he is still pretty imposing, making him fitting to be the last of the first trio of Skorned that Artie defeats. He wears a brown gauntlet on his left arm with even sharper claws than his normal ones. It’s unclear to most where he got it and why he wears only one. – Cern, Bern and Usn are all based on the classic mythical beast; Cerberus, in many ways. For starters, there’s the name. Cerberus is split into three syllables which make up their names. Bern is the second of them of course. – The Golden Jackal had a reddish hue in its fur, along with its grey coat. This fact was also used to inspire the skin colour of Cern, Bern and Usn. Bern is a mixture of red and grey, somewhere in the middle. – Cerberus was also to be believed that each of his three heads represented the past, present and future. This tidbit also inspired the design of Cern, Bern and Usn. Each one of them has tail and shoulder fur that resemble flames. The appearance of these flame-like fur pelts for each character represents past, present and future, like Cerberus. 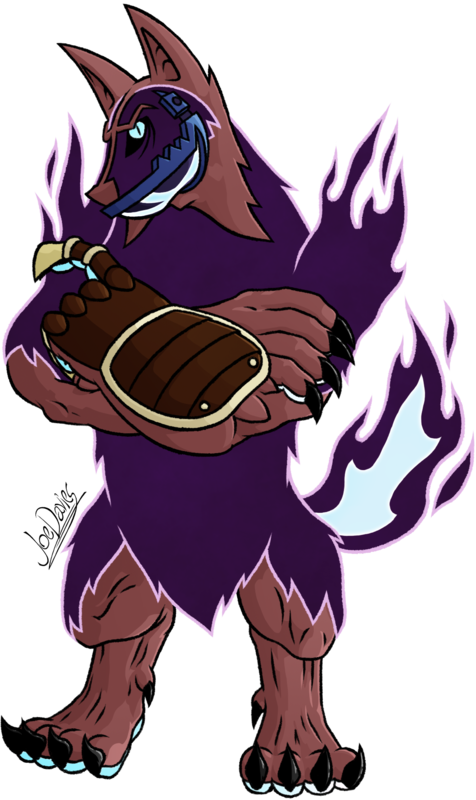 In Bern’s case, he represents the past, with his tail and shoulders looking similar to a blazing fire.